In JP Morgan's Quarterly Market Guide a pair of charts on page 31 caught my eye. I don't have any faith in forward PE estimates. They tend to be overly optimist and subject to numerous "one-time" writeoffs. Instead, I recommend watching 10-year smoothed PE ratios. See discussion below. Nonetheless, please note that even on a forward-basis, the S&P 500 ratio is well above most other markets. On a price-to-book basis, US equities are twice as expensive as numerous other markets. The Case-Shiller PE is a Cyclically Adjusted Price-to-Earnings ratio, commonly known as CAPE, Shiller P/E, or P/E 10 ratio. To calculate "CAPE", you divide the current price by the inflation-adjusted average of the last ten years of earnings. 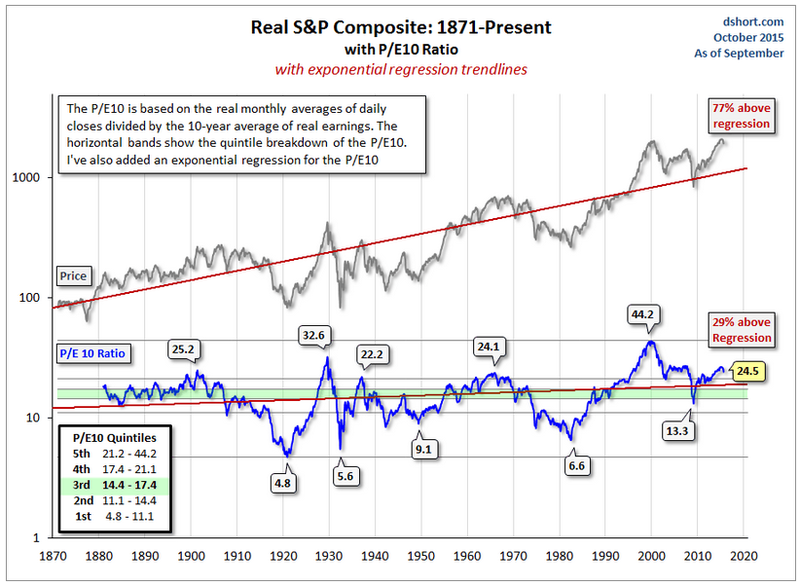 Here is a link to the Current Shiller PE, updated daily. A better-looking chart is shown below. 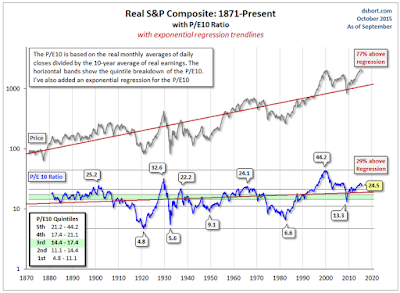 Doug Short at Advisor Perspectives does periodic updates to the Shiller PE. His latest was on October 1 in Is the Stock Market Cheap? On a PE/10 basis stocks are in the fifth quintile range signalling extreme overvaluation. Higher smoothed PEs happened in 1929, the dot-com bubble, 1902, and earlier this year. The historic P/E10 average is 16.6. After dropping to 13.3 in March 2009, the ratio rebounded to an interim high of 23.5 in February of 2011 and then hovered in the 20-to-21 range. It began rising again in late 2013 and hit a new interim high of 27 in February of this year. It has now dropped below that high. For further discussion on just how over-valued US equities are, please see Bubble Debate; Equity Allocations vs. Shiller PE; Simple World.